What’s up? How are you all doing? This post is dedicated to all of my loyal followers on Instagram. Recently, I posted a poll on Instagram Stories and it’s because of you I came to the topic of Drugstore Highlighter Under 1000/- rs. Before we didn’t have such quality product from these brand, However, only a few were the options in the market available back then. Since past few years, Drugstores brands had been coming with great makeup products. Brands like Essence, ELF, Makeup Revolution, Makeup Academy, Maybelline (always had the best quality, no doubt) and Clazona (love the liquid lipstick from this brand) have been the best drugstore brands with the affordable price range and quality at it best. So here are my few favorites and affordable highlighters. This highlighter gives a very natural glow to the face. Although it doesn’t have a shimmery or glittery particle to it, which is why it won’t give you that 100-watt glow. 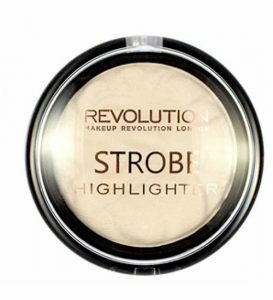 If you are looking for a natural look highlighter for the daily look then this is perfect for you. Cost of this highlighter is 525/- pkr only. You can find this highlighter in Pakistan at any makeup shop or store. To order online here is the link. 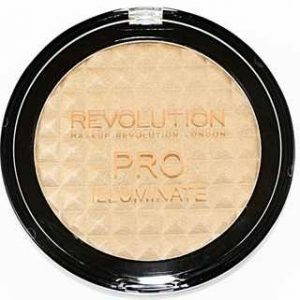 Makeup Revolution is my favorite brand, it never disappoints me. From Eyeshadow Palette to Lipstick it has amazing quality product. This strobe highlighter is buttery and glides to the face easily. It doesn’t have glitter chunks to it but still gives a beautiful glow on the face. It’s worth for 600/- pkr. It is available at Just4girls. LA Girl has huge popularity among concealer range. Every beauty gurus and most of the MUA prefer to use LA Girl pro concealer for color correcting and concealing. LA Girl Strobe lite 100-watt is the gorgeous champagne color with gold glitter in it. It may enhance your skin texture a little bit if you apply more then 2 layers. Although just 1 stroke will give a sheen finished look on the face. it retails for 950/- Pkr and available at Just4girls and Daraz. Crown of my canopy is a gorgeous peachy bronzer shade. This is as good as blush + highlighter. 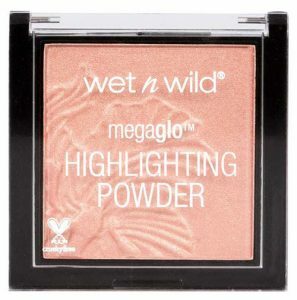 Wet n wild megaglo highlighters are in trends and they are super affordable as well. These single highlighter cost 899/- pkr or you can buy the palette Illuminatrice which cost 2675/- which mean one pan will cost you 668/- pkr. Uhh! quite reasonable. find these amazing megaglo highlighter on Just4girls and for palette click here. So that’s all my glowing fellows. I hope this all information might help you to choose perfect highlighter for yourself. 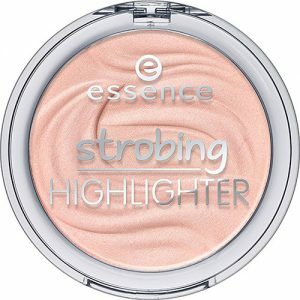 Let me know which drugstore highlighter is your current favorite highlighter? Mine is Massarat Misbah blush which is equal to my daily routine highlighter. Unfortunately, it’s not under 1000/- rs otherwise it would be my top pick. So stay glowing, until next time!